This is the fourth installment of the “Breakfast Around the World” posts series and I predict that it will be my most comprehensive breakfast guide so far. Why? Because today we are heading to Russia! The country which has a border with Lithuania – I am from there, if you didn’t know that! The country my father is from. The country where my late grandmother lived, and where I still have few relatives. What I want to say here is that I am very familiar with the Russian culture and eating habits, so I will be able to speak from my real experience, not just rewrite the information from other sources. Let’s see how the famous Russian breakfast looks like. Can’t wait! Let me start by telling you that eating habits in Russian cities and in small provincial towns and villages differ a lot. While people in villages stay true to traditions or sometimes don’t care what they have for breakfast at all (eating leftovers from last night’s dinner is a common thing), inhabitants of the cities lately choose the European type of breakfast: porridge, cereal, coffee, pastries and so forth. This distinction happened only in the last two decades when Russia became more open to Western ideas. In the times of USSR, traditions were still alive in big cities too, so everyone was eating buterbrody (open-faced sandwiches) with “Doktorskaya kolbasa” (famous Russian boiled sausage) or smoked sausage (harder to get), pancakes, various kashas (cooked buckwheat, semolina or other grains), fried or boiled eggs and other “simple” things for breakfast. It was complicated to get something more interesting in shops because of the food shortages. In this post I will show you how the traditional Russian breakfast looks nowadays (with shops full of all the products you want). It means that I will talk more about what Russians eat for breakfast in small towns and villages, rather than big cities. 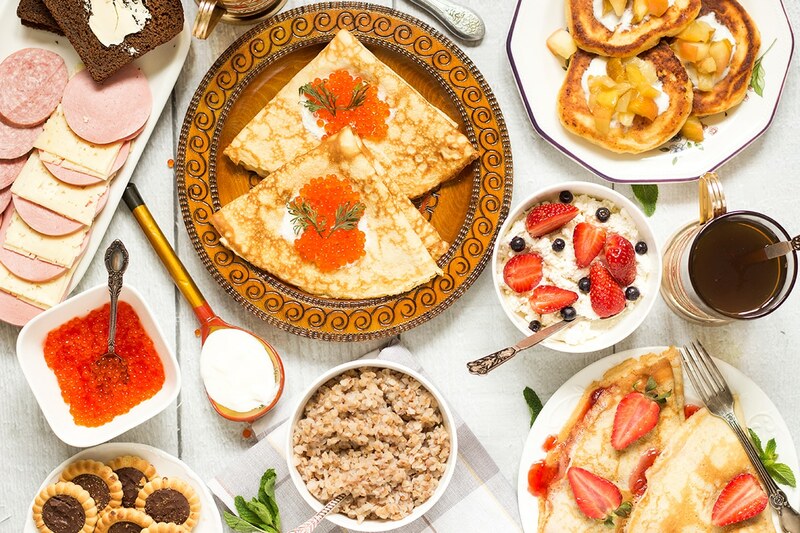 I don’t think there is a need to talk about coffee, cereal and other international stuff that the new generation of Russians choose for breakfast today, because you already know everything about it. We want traditional stuff, right? Oh and just for the record: all the food you will see in this post is by no means a daily breakfast of a typical Russian. Some of these dishes are made only on weekends because in today’s busy life there is no time to make something sophisticated in the mornings. Let’s see what I have prepared for my traditional Russian breakfast! 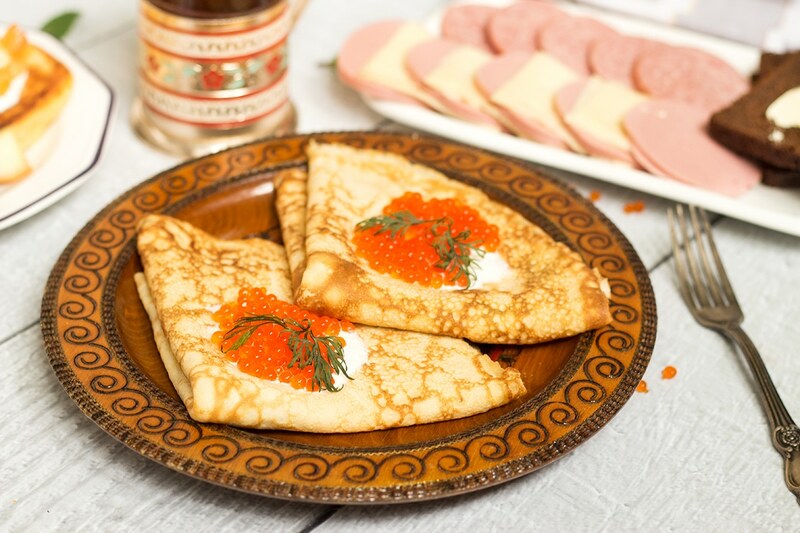 We have to start from pancakes, because it has been a staple of Russian cuisine for more than a thousand years! It’s one of the oldest, if not the oldest, Russian dishes. People love it. Oh, they do. 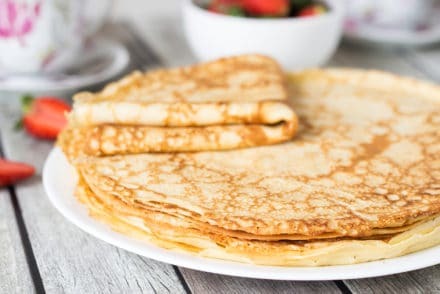 There is a huge variety of various pancakes in Russia and all of them are perfect for breakfast. Well, maybe except the potato pancakes, ha! 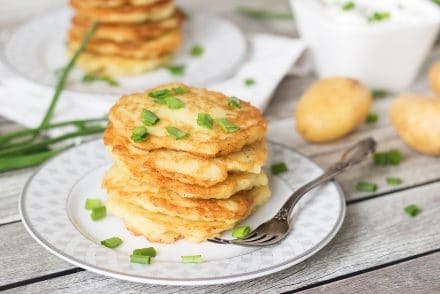 All other ones, such as thin pancakes called Blini, with numerous toppings, cottage cheese pancakes (Syrniki), Blini made from buckwheat, Blini with stuffed fillings inside and so on are popular guests on the Russian breakfast table. Nowadays it’s more like a weekend breakfast choice, because of the lack of time in the busy mornings. 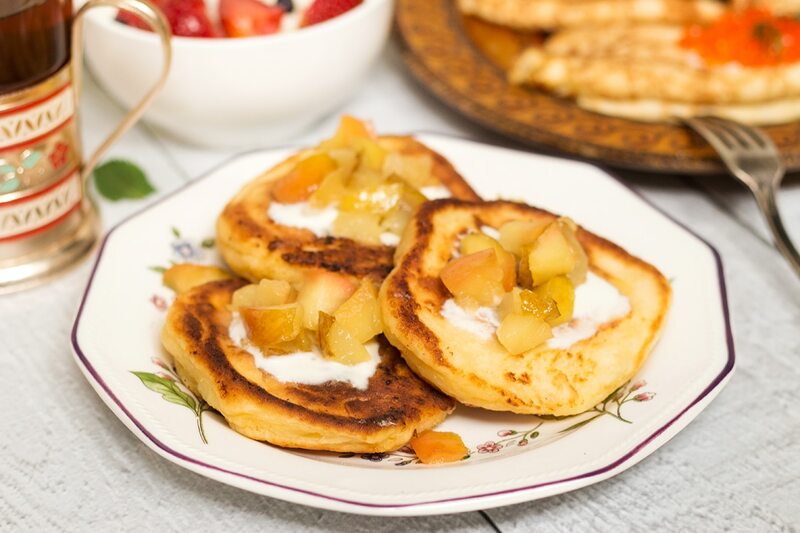 I made two types of pancakes for my Russian breakfast: cottage cheese pancakes, called Syrniki, with caramelized fruit and sour cream on top (recipe here), and few types of Blini – sweet and savory. For the savory topping, I chose a beloved Russian delicacy – caviar, with a dollop of sour cream. There are some stereotypes floating around about Russians and their caviar. People from other countries picture Russians eating tons of black and red caviar every single day. Well, it’s not true at all. Don’t get me wrong, they DO like it a lot. They would surely eat it every day if it wasn’t so expensive. Yes, red caviar nowadays is considered a delicacy and you have to dig deep in your wallet for it. I am not even talking about black caviar – it’s crazily expensive. I just wanted to make something more interesting for my Russian breakfast table (as well as remember the taste of caviar) so I bought a small, really small, can of red caviar. For cheaper savory toppings you can use smoked salmon or other fish. For the sweet Blini topping I went with a time-tested strawberry jam and few fresh berries on top. Feel free to use any jam you like. Honey is a great option too. 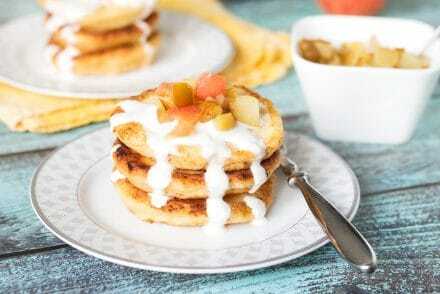 Recipe for both types of pancakes is here. 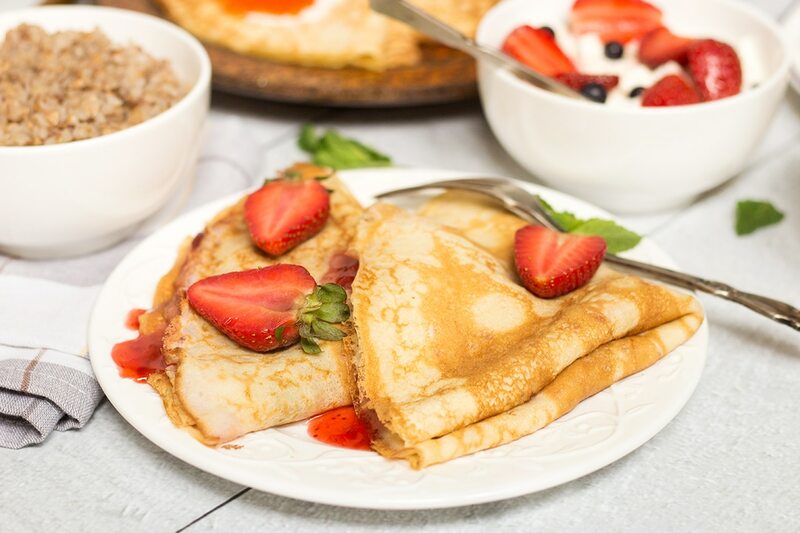 If you will ever try to replicate the traditional Russian breakfast at home, you just have to make at least one type of pancakes. The breakfast won’t be Russian without them! Another Russian staple. I still remember my mother forcing me to eat Kashas when I was a kid! It’s one of the healthiest breakfast options (way healthier than pancakes) so I can understand her. Kasha is a dish made of any kind of grains boiled in water or milk (thank you Wikipedia for the explanation!). It’s like a porridge. The most popular Kashas are made from buckwheat or any cereal wheat, barley, oats, millet and rye. Rice can also be used. I made one of the most traditional and popular ones – buckwheat kasha. It’s really hard to define Tvorog. To simplify, I will just say that it’s a type of fresh dairy product, similar to farmer’s cheese or cottage cheese. I made Syrniki (pancakes) using cottage cheese and the result was pretty similar to what I’m getting with Tvorog, so you could say that they don’t differ too much. Russians not only make pancakes from it, but also love eating fresh Tvorog mixed with berries or fruit. It’s a healthy, tasty and really quick breakfast option. These open-faced sandwiches made with different types of sausages, cheeses, smoked fish, spreads are a really popular Russian breakfast option. Or should I say they WERE popular? It’s hard to tell. 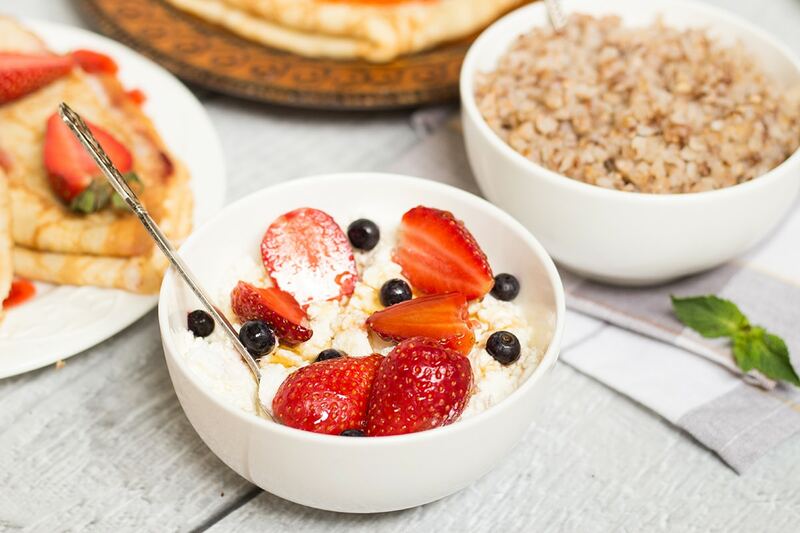 Nowadays more and more people shy away from buterbrody because there are much healthier breakfast options than eating sausages in the early morning. Of course I am talking about big cities here. Small provincial towns and villages still love buterbrody and most probably won’t move away from them in the nearest future. I will be frank with you. I am one of those who still loves to have few sandwiches in the morning! I know that they are not healthy, but I can’t do anything with myself. They are so good! For this post I have sliced the famous Russian boiled sausage “Doktorskaya“, some smoked sausage and cheese. Just take a piece of black bread (Russians love it), slather some butter and top with sausage and cheese. Your buterbrod is ready! The interesting fact. The name of these sandwiches sounds exactly like butter and bread. Buterbrod. Looks like it’s not a Russian word after all. Tea culture is huge in Russia. Once again, with the arrival of Western culture, the new generation chooses to start a day with a cup coffee, but 20 years ago it was tea that helped to get some energy in the morning. Tea is still very popular in Russia. Together with cookies it’s a perfect breakfast dessert. I am, by the way, one of those people who still drink tea every morning and evening (maybe except summer because it’s too hot) and don’t drink coffee at all. Love it! That’s it, my dear readers! I have skipped eggs, because there are so much countries in the world that eat them for breakfast! Russia is not an exception. Russians love eggs fried or boiled, and they are a popular breakfast option. Now, what’s my opinion about this breakfast? Of course I loved it. I grew up with such a breakfast so it will always be one of my most favorites ones. I am really sure that you will love it too, if you try it! Thank you for you attention and see you in other “Breakfast Around the World” posts! 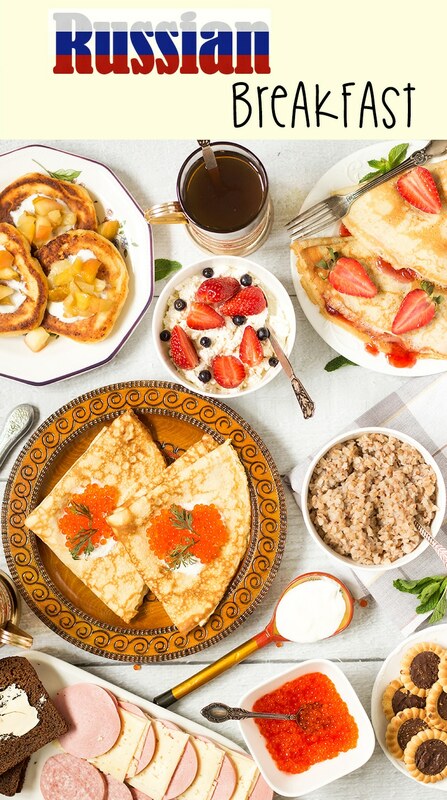 Traditional Russian breakfast features their famous big & thin pancakes (Blini), cottage cheese pancakes (Syrniki), buckwheat porridge (Kasha), and more goodness! 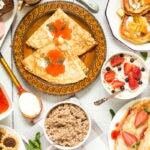 Just serve all the items and enjoy your traditional Russian breakfast! I really enjoy these “Breakfast Around the World” posts. I’m not a fan of typical American breakfasts — pancakes, waffles, cereal, etc — because I don’t like sweet things in the morning. I’d definitely enjoy some buterbrody in the morning, though! Chai has been my nr 1 thing in the morning for about 20 years now 🙂 The best! This is such a beautiful page. I love this! When I had a layover in Moscow, my hotel had all of these options for breakfast and I thought to myself… wow! Russians really kick it up a notch when it comes to breakfast. I still dream of the salmon caviar with on the pancake, I didn’t think I would like it but I LOVED IT!